As hundreds of thousands of federal workers faced furlough during the recent government shutdown, American University faculty and staff sprang into action. And many of those furloughed government employees were the beneficiaries. AU’s School of Public Affairs partnered with faculty and staff from across the university to host “Classes Without Quizzes,” a day of workshops, classes, and networking. More than 500 government employees participated in the January 8 event. 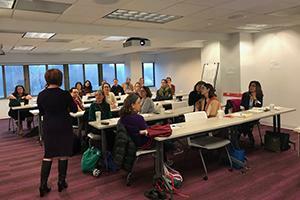 And the School of Professional and Extended Studies offered 13 in-person sessions during the shutdown on topics ranging from network analysis to the history of presidential pardons. SPExS also partnered with the School of International Service to host several webinars. Staff member Alison Donavon, who was instrumental in the success of the School of Professional and Extended Studies’ AU4U series, said “We felt like AU was the perfect place to host all of these service-oriented workers.” And many of them agreed.